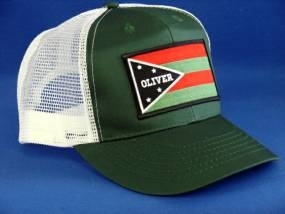 Oliver Flag Logo, Embroidered Patch, Applied To A Good Quality, Mid Crown, Mesh Back Cap. Green/Green/White In Color. With Plastic Snap Adjustable Closure. One Size Fits Most.